When you buy your outdoor furniture from Majestic Teak by Touch Up Teak you get high quality built for generations furniture. Majestic Teak provides the strongest commitment on custom finishing and the strongest maintenance warranty in the industry. Our products are crafted with Selected Grade-A Teakwood, by highly experienced and skilled people in the Industry, containing Wood Dryness Less Than 10-12% MC, Control Design to Maintain Uniformity in Product Shapes & Sizes Control Cutting Process into Equal Size Components Control Assembling Process Control Finishing Process. Enjoy the beauty of your backyard and the pleasure of the outdoor dining with Bahama Dining Table and Classic Dining Armchairs. This set includes a 35" square table that fit for 4 people comfortably. 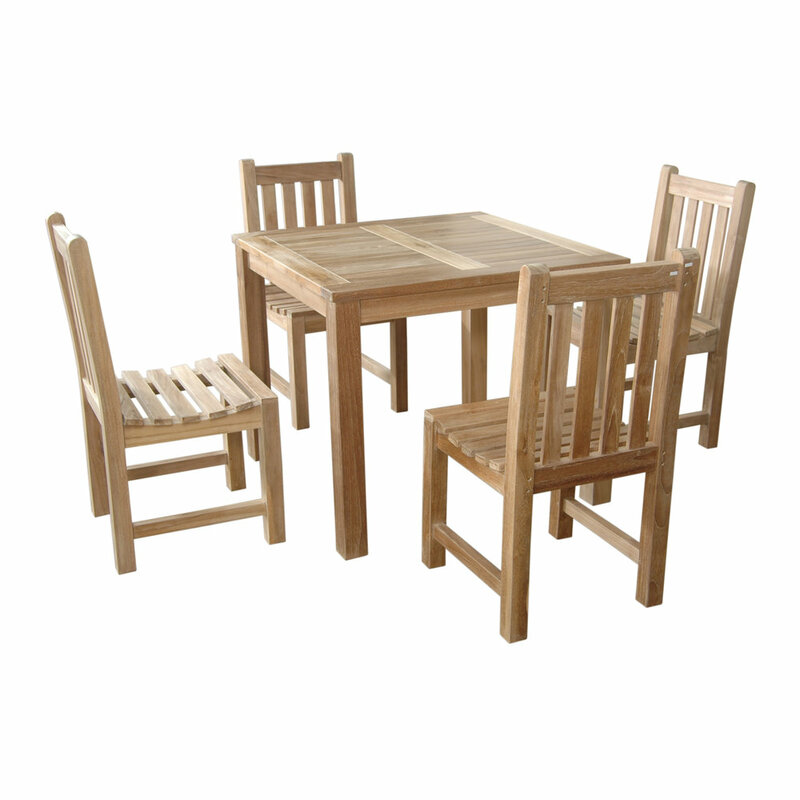 Table and chairs are all constructed using mortise and tenon construction for strength and durability. The outdoor furniture made of premium quality plantation grown teak. This set will provide decades of enjoyment for family and friends. Add all weather cushions for more comfort and a pop of color. The Bahama Rectangular Extension Table makes the perfect addition to your patio or backyard. The unique built-in butterfly pop-up leaf enables you to open and close your table in less than 15 seconds. The leaf folds away for easy storage. This table stands 29" high and is 39" width by 78" long and if fully extended can reach opening to 118" long. The table can be extend with 1 or 2 leaves, seats 8 to 10 people comfortably. The table has the umbrella hole in the center when the leaf opens. This table is combining with Sahara Dining Chair which has traditional curved back style-dining chair which will hold your back comfortably. The style will never go out, but quietly blends with any other design. The seat is very sturdy as well as the back. This beautiful classic bench is so simple but yet uniquely designed for house or backyard with a lot of straight pattern, the bench will never go out of style, but quietly blends naturally with any décor. We have made subtle but careful design changes to ensure excellent back support. Place a single bench under your trees; use a group of benches and chairs for entertaining or gathering with friends and family for the entire evening. Add Sunbrella all-weather cushions for more comfort. Cushion are sold separately. Quality built for generations. Enjoy the beauty of your backyard and the pleasure of the outdoor dining with Tosca Round Dining Table and Classic Dining Armchairs. This set includes a 47" Round Table that fit for 4 people comfortably. Table and chairs are all constructed using mortise and tenon construction for strength and durability. The outdoor furniture made of premium quality plantation teak. This set will provide decades of enjoyment for family and friends. Additional all weather cushions from Sunbrella can be applied for extra comfort. Cushions are sold separately. The Windsor teak wood table is a square dining table that is perfect for both indoors and out. Perfect size for 4 people while enjoying the dine surrounding with friends or family. Combining with Brianna armchair will make this set be the center of the evening conversation. The table and chairs are all constructed using mortise and tenon construction from strength and durability. The set made of premium quality plantation grown teak from Indonesia where the best teak tree grows. It is built with durable teakwood to ensure many years of continued use. Add all-weather cushions from Sunbrella for extra comfort. Cushions are sold separately.